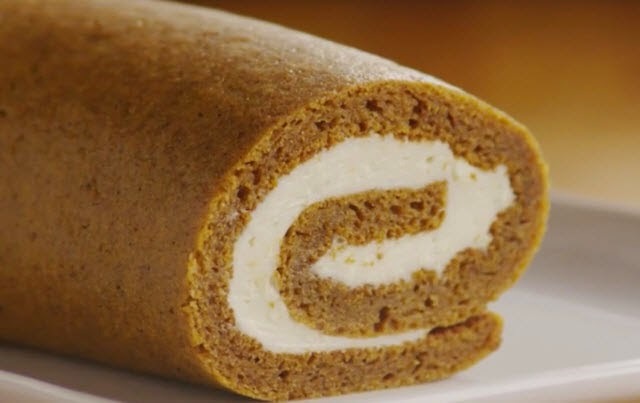 A favorite dessert that is made often around our family is the Pumpkin Roll. It usually begins right around Thanksgiving, someone will bring one to a dinner at church or to one of the family Thanksgiving meals and it continues throughout Christmas! It's a winner! Our church put out a cookbook many years back and it is one of my go-to recipe books. Many ladies submitted recipes, sharing their speciality dishes. This comes from a dear lady that I love. I used to babysit her son when he was young and every once in a while he comes to stay with me. I adore him! Line a 15x10" jelly roll pan/cookie sheet with wax paper. Spray with nonstick spray. Combine flour, baking powder, baking soda, cinnamon, cloves, and salt together. In another bowl, beat eggs and sugar until thick. Beat in pumpkin. Stir in flour mixture. Pour and spread evenly over the prepared pan. If desired sprinkle with nuts. Now, here's the only trick to this! Once baked, let cool for a minute or two. Have another sheet of wax paper sprinkled with powdered sugar laying on the workspace. Turn your cake onto that wax paper. Gently remove the paper you cooked with. Sprinkle opposite side of roll with more powdered sugar. Carefully roll your pumpkin roll up in the wax paper and allow to cool completely. This will help ensure you will have a nice roll to your finished dessert. Else if you don't roll it while warm, it will NOT roll once cool. Now! For the yummy filling! Beat all together till smooth. Once your pumpkin roll is completely cool, unroll carefully. Spread cream cheese mixture over roll and gently roll back up. Sprinkle with a bit more powdered sugar. Wrap in plastic wrap and refrigerate at least one hour. Slice and sprinkle with more powdered sugar when serving.